Do you know how to make Baileys cheesecake recipes? All my Irish cream recipes are made with Bailey’s Irish Cream As I always state if I go to the trouble and expense of making recipes I want to use the best ingredients possible. (I have learned the hard way! )This is especially true when making things like cheesecakes when you also have the additional expense of the cheese. I have found that Baileys produce the very best flavor in these recipes. I have learned how to make many Baileys cheesecake recipes. My favorite one starts with a chocolate cookie crust then topped with a creamy chocolate cream cheese filling; this Irish cream add the great taste to this creamy cheese filling. It is made with fifty percent of fresh cream and Irish whiskey. I have heard that some people make their own Irish cream at home by using Irish whiskey and cream plus adding a little coffee and a little chocolate syrup. I am perfectly satisfied with the results that I get by purchasing the Baileys Irish cream. Learning how to make my Baileys cheesecake recipes has made me famous in my world because of this liqueur. Baileys Irish cream was the first of its kind on the market and it is now world famous for its flavor. A special process is used to prevent the alcohol from separating from the cream. I use Irish cream in many of my recipes; it is wonderful especially in desserts. 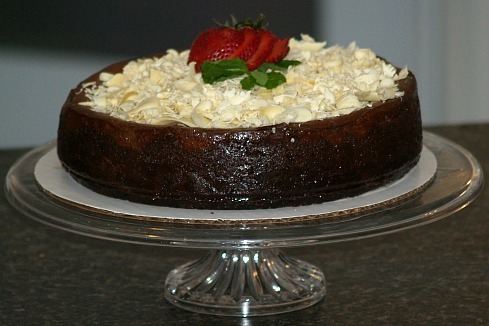 I love my delicious Baileys cheesecake recipe! 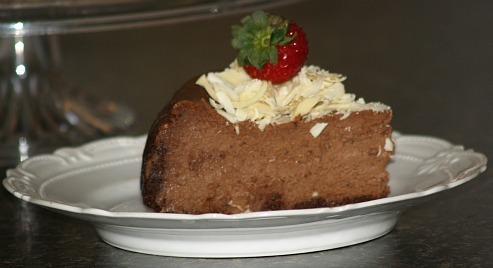 I garnish the following Baileys cheesecake recipe with chocolate curls; it adds a beautiful touch on many desserts. Making chocolate curls is not difficult. Small curls are quite easy the key is having the chocolate bar (or block) at room temperature. Making chocolate curls in a larger size takes a little more time but is not difficult either. Place 1 ½ ounces semisweet chocolate (not the pieces) with 1 teaspoon shortening in a small heavy saucepan. Melt over low while stirring. With a metal spatula spread chocolate evenly over the bottom of a glass baking dish. Let stand until set. Press a straight edged metal spatula against the dish just inside the chocolate. With gentle steady pressure push the spatula straight forward at a 45 degree angle. Do not touch curls but gently lift out with a skewer. Place on wax paper and use immediately or store in refrigerator. These make beautiful chocolate garnish for desserts. They can be made with milk chocolate or white chocolate. Combine crushed wafers, melted butter and cinnamon in medium bowl; toss to mix. Press evenly in bottom of 9 inch spring form pan; set aside. Combine cream cheese, sour cream, sugar and the 8 ounces of melted chocolate in mixing bowl. Beat cheese mixture on medium speed until well blended. Add eggs one at a time beating on low just until blended. Stir in Baileys Irish cream, whipping cream and vanilla. Pour mixture into crust lined pan. Set spring form pan on shallow baking pan in oven. Bake for 50 to 60 minutes or until middle appears to be nearly set. Cool cheesecake on wire rack for 15 minutes. Run knife around sides of pan to loosen cake from sides; cool 30 minutes longer. Garnish with chocolate curls, berries or leaves. By combining Irish whiskey with the ingredients in this recipe you will achieve the same flavor as adding Irish cream. Combine crumbs, ¼ cup sugar and melted butter; press into bottom of 9 inch spring form pan. Blend in ¾ cup sugar and beaten egg yolks; cook over low heat 3 minutes stirring constantly. Combine cream cheese and cocoa powder mixing on medium speed until well blended. Gradually add gelatin mixture and Irish whiskey mixing until blended. Chill until thickened but not set. Beat egg whites until foamy; gradually add in remaining ¼ cup sugar beating until stiff peaks form. Fold egg whites and whipped cream into creamed cheese mixture; pour over the crust. Chill until firm; garnish with chocolate curls. Combine the cracker crumbs, ¼ cup sugar and melted butter. Press mixture on bottom and ½ inch up sides of 9 inch spring form pan. Beat cream cheese on medium speed of mixer gradually adding 1 cup of sugar. Add eggs one at a time beating well after each addition; stir in ½ cup Irish cream. Pour mixture into prepared pan; bake for 45 to 50 minutes or until middle appears set. INCREASE OVEN TEMPERATURE TO 500F degrees. Combine sour cream, 2 tablespoons Irish cream and 2 tablespoons sugar; spread over cheesecake. Bake at 500F degrees for 5 minutes. Run knife around sides to loosen cake from pan; chill for at least 4 hours. To serve remove sides and garnish. Preheat oven to 350F degrees; Light grease 9 inch spring form pan. Wrap tightly bottom and sides of pan with double layers of foil. Press mixture into bottom and 1 inch of sides of pan. Beat cream cheese with sugar and cornstarch. Add the Bailey’s Irish Cream, vanilla and salt. Add the eggs and yolks one at a time beating until all is incorporated.. Combine heavy cream, milk and white chocolate in a saucepan. Heat mixture over low stirring until chocolate melts. Blend warm mixture into cheese mixture; pour into prepared crust. Place cheesecake in larger shallow pan; pour hot water into larger pan about 1 inch. Bake for 90 minutes or until set in the center. Cool on rack 15 minutes; run knife around inside edge of pan to loosen. Cool on rack until room temperature; refrigerate overnight. Remove sides of pan to serve; serve with fruit if desired. This Bailey’s cheesecake recipe is chocolate marbled. Preheat oven to 350F degrees; place oven rack in center of oven. TO MAKE CRUST combine and blend the crumbs and butter. Press mixture into bottom of 10 inch spring form pan; chill. TO MAKE FILLING combine cheese, sugar and salt in large mixing bowl. Beat on medium speed of mixer until blended. INCREASE speed to high beating until creamy. DECREASE to medium speed; add sour cream, Irish Crème and vanilla. Continue beating until well blended; add eggs beating JUST until combined. TO MAKE CHOCOLATE MARBLE measure 2 cups of filling into small bowl. Scrape in the melted chocolate and mix well; stir in cocoa powder. Pour white cheesecake filling into the prepared crust smoothing surface. Add large spoonfuls of the chocolate marble around the top of filling. With a small sharp knife swirl through chocolate for marble effect. Wrap 2 layers of foil tightly around bottom and half way up sides of pan. Place pan inside a larger shallow pan. Pour hot water in larger pan half way up sides of spring form pan. Carefully place both pans in oven; bake about 80 minutes. NOTE: Top should be golden brown and center slightly firm. Carefully lift out spring form pan and place on rack. Fold away the foil from sides to help cool the cheesecake. To serve run sharp knife around edges to loosen cake from pan. Remove sides from spring form pan; dip knife in warm water to cut slices. Garnish with shredded chocolate if desired; serves 12 to 14.